Real Dentistry is the practice of Hercules Real, DDS, in Fullerton, CA. The practice believes that a healthy, attractive smile is important to one’s self-esteem and well-being, in addition to personal, social and professional relationships. Dr. Real was opening his own practice and wanted to convey his philosophy and services to the prospective patients and the community. In addition to a brochure describing his services, Dr. Real wanted to launch a grassroots marketing campaign targeting families in the neighborhood. I developed a concept which formed the basis of all aspects of the practice’s branding. I proposed photographing Dr. Real’s actual patients in real-life situations—real dentistry for real people. I created large prints displayed on the walls throughout their office, showing off patients’ great smiles. 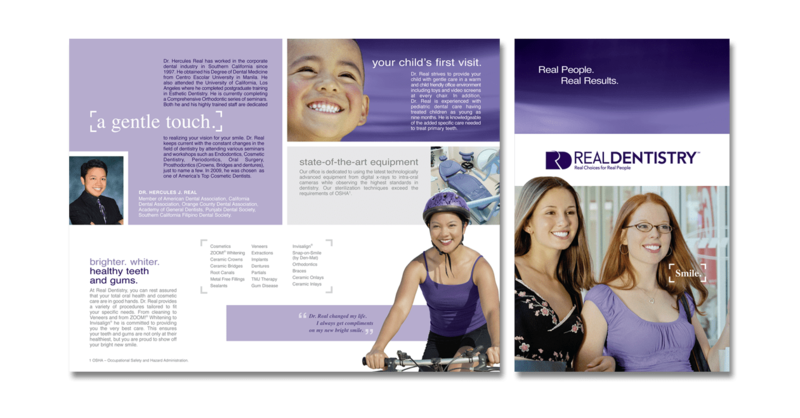 I extended the concept to a company brochure providing information about Dr. Real, his mission and his services. In addition, I developed and designed a direct marketing brochure targeted to local families. 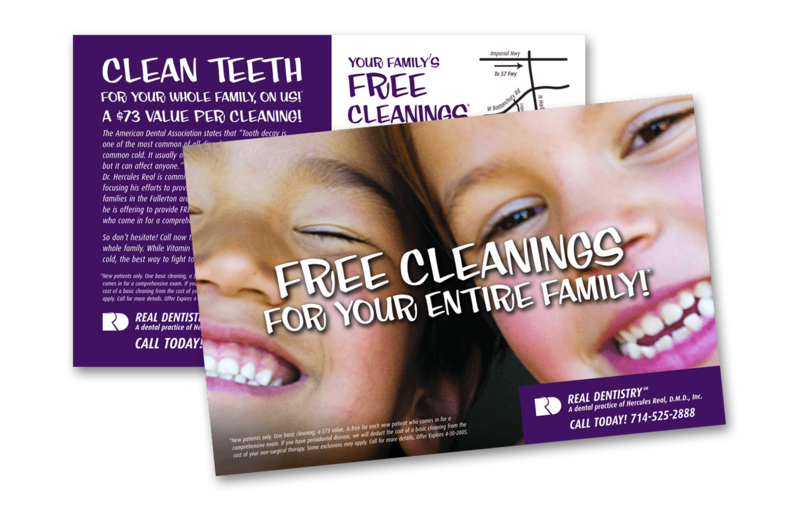 It included clean and simple messaging along with the photography-rich branding, and an offer for a free dental cleaning. The response was outstanding. The practice saw a major increase in business over the course of the campaign.